Is the €65 Minimum Spend Worth the Sunset View at Café Mambo in Ibiza? The Western shores of Ibiza in the San Antonio area is famously known as the sunset strip. Two of the iconic establishments there for sunset watching are Café Del Mar and Café Mambo. I originally wanted to go to Café Del Mar because it was more well known to me, but Café Mambo seemed to have a more lively crowd compared to Café Del Mar so we veered to the right and headed to Mambo. Café Mambo has been patroned by famous celebrities and DJs including Paris Hilton, Steve Aoki, Erick Morillo, Pete Tong, Martin Solveig, and David Guetta. There are framed polaroid photos of famous guests on their walls. There’s a large patio at the front of Cafe Mambo, and those tables are the most desirable spots for catching the sunset. The best seats have a minimum spend of €65 per person on food and drink. Given that most main courses are €20+ and drinks are €10+, it wouldn’t have been difficult to rack up the minimum spend. However, we weren’t sure we wanted to commit to spending so much on drinks, especially since we had alcohol back at our hotel which would be the more affordable pre-party option. Fortunately, we lucked out and were able to get a table closer to the back on an elevated part of the patio that didn’t have a minimum spend. Rarely available without reservations, there must have been a cancellation shortly before we arrived as our hostess took off the “reserved” place card on the table. 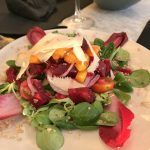 The one dish I really enjoyed was the Summer Salad (€17.00) with quinoa, pomegranate, endives, mango, lettuce and parmesan. 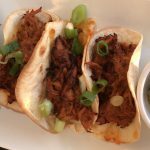 There wasn’t anything special about anything else we ordered: the Tortilla Chips with Salsa and Guacamole (€8.00), Tiger Prawns in a Thai Coconut Sauce with Rice (€28.00) , Pulled Pork Tacos (€18.50), and Chicken Tacos (€18.50), were really plain. The trio of tacos didn’t even come with any sides – for the amount we spent, you’d think they’d at least have a small salad or fries with it. Food was good, but certainly not outstanding or memorable and didn’t justify the price. As expected, people come here for the view, not the food. I was quite disappointed in the music during dinner, 80’s love songs and soft rock – stuff you’d hear at a resort with your parents, not a party island known for its balaeric beats. If we had stayed past 9pm, we would have seen a free DJ Martin Solveig set, who was playing a Pacha pre-party set at Café Mambo. That would have definitely been a perk of going to Mambo that night. However, we were already done dinner by 8, and had other plans that night, so we took off to head back to our hotel and get ready. 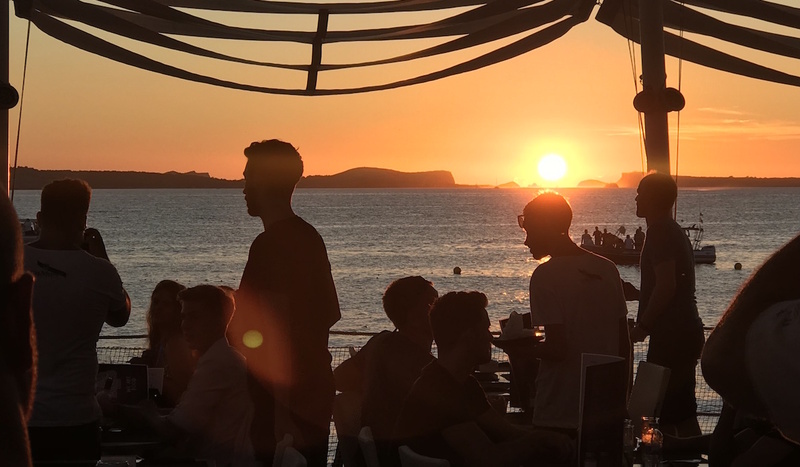 To answer the question I set out to answer in this blog post: watching the beautiful sunset from the San Antonio strip during your visit to Ibiza is a must, but you don’t HAVE to watch it at Café Mambo or Café Del Mar. If your objective is only to see the sunset, we saw plenty of people show up, and watch it for free from the beach between the two restaurants. Why not bring your own food and wine to the beach, or eat elsewhere after the sunset? There’s no need to spend on overpriced food and drink. However, if your plan is to stay at Café Mambo and catch a Pacha pre-party, with a DJ you actually want to see, then it’s well worth it kill multiple birds with one stone: stay for a few hours and have your dinner and drinks to meet the minimum spend, comfortably watch the sunset with unblocked views, and party to a well-known DJ, all for less than the price of what you’d pay to get into a club.